Rumour: HSPA Pre and Pixie Coming to Telus? It's been no secret Telus has been working on transitioning from their CDMA network to an HSPA one, as evidenced by the above SIM card. Well, now there is a rumour floating around that Telus could be getting an HSPA Pre as early as January 2010, as well as the Pixi soon after. Some will recall, back before it was announced that Bell had exclusivity with the Pre, there were also a few rumours that Telus was trying for the Pre as well. Obviously we know how that ended: Bell won and got exclusively for a rumoured 6 month period. 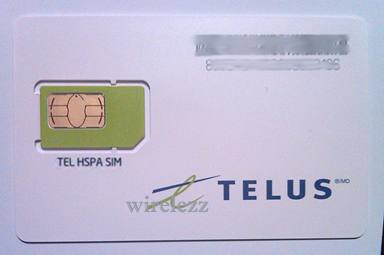 So i got word today that the Pre will be coming to TELUS (HSPA Style) soon as well as the EOS/Pixie (later this year). Engadget posted the official photos/videos earlier today (right after i got word at work). Well since TELUS will be getting the HSPA Pre in Jan and the EOS at the same time, I'll let you all know then. This is very welcomed news Not only for people in provinces Bell doesn't sell to (like Manitoba or Saskatchewan) such as myself, but also as it could possibly be unlocked to worked in the USA. A January release is a little shy of 6 months, but is still pretty close and something to look forward to, if it's true.